Blackie Kondo was an outstanding ballplayer and an outstanding soldier. But it would all end on a battlefield in Italy. Harushi "Blackie" Kondo, son of Mr. and Mrs. Namisuke Kondo, was born at Aiea, Oahu in the Hawaiian Islands on May 28, 1913. Like many people in Hawaii, Kondo was Nisei - second-generation Japanese. He was educated at Aiea Elementary and Intermediate School before working as an electrician for the Honolulu Plantation Company in Oahu. Kondo was an excellent baseball player and played on Aiea team for several seasons. Kondo entered military service on December 10, 1940 and served at Schofield Barracks, Oahu. One year later Pearl Harbor was attacked by the Japanese and while most Japanese-Americans were sent to internment camps, the Japanese-Americans of the Hawaiian Territorial Guard became the 100th Infantry Battalion - a fighting unit made up entirely of second-generation Japanese. In 1942, Kondo headed for the mainland for basic training with the 100th at Camp McCoy, Wisconsin. 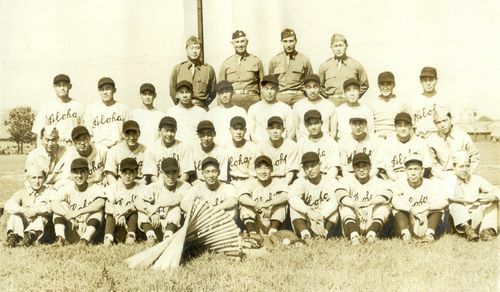 The young ballplayer quickly became a part of the 100th "Aloha" baseball team which initially played against the military police unit at Camp McCoy but soon found competition in nearby towns. In February 1943, the 100th Battalion moved to Camp Shelby, Mississippi for advanced unit training where the Aloha team continued to play. The 100th Battalion left Camp Shelby for North Africa on August 11, 1943. They landed at Oran, Algeria on September 2, where they guarded supply trains for a couple of weeks. It was in North Africa that the Aloha baseball team played their last game. Challenged by the 133rd Infantry Regiment, the 100th called upon Lieutenant Paul E. Froning, who had just joined them. Froning would pitch in the minors after the war and helped defeat the 133rd, 26 to 0. On September 19, 1943, the 100th Battalion left the relative safety of North Africa for Italy. They landed at Salerno and went into combat against the Germans on September 29. Private First Class Kondo was killed in action near Venafro, Italy on November 4, 1943. He was awarded the Silver Star and Purple Heart. Kondo was survived by his parents, two brothers and four sisters. He is buried at the National Memorial Cemetery of the Pacific in Hawaii. Thanks to Kerry Yo Nakagawa of the Nisei Baseball Research Project and Hawaii State Library for help with this biography. Photo of 100th Battalion team courtesy of Sons and Daughters of the 100th Infantry Battalion Archives. Visit www.ajawarvets.org for more information on Americans of Japanese ancestry servicemen. Thanks to the Honolulu Advertiser for supplying copies of related press articles. Thanks also to Astrid van Erp for help with this biography.